A dear friend of mine recently read French Twist: An American Mom’s Experiment in Parisian Parenting and told me she was suprised to learn that French parents discuss clothing with their children – and even believe that teaching them style is part of raising them. Her surprise surprised me because I assumed that her mother – a very chic woman – had, like my mother, imparted such wisdom to her. But after canvassing several friends, I discovered that my upbringing, which I assumed was so normal, may not be the norm. 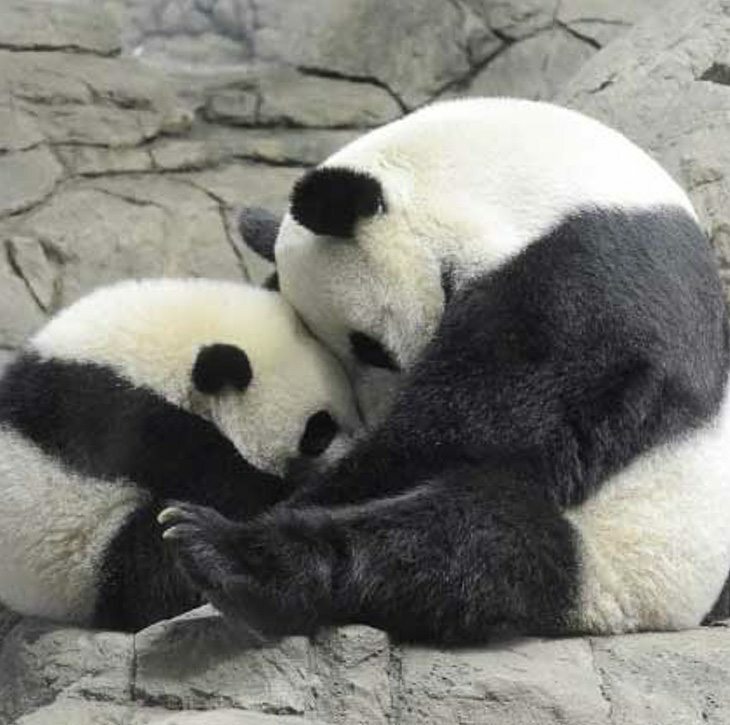 Mei Xiang and Bao Bao in matching mother-daughter ensembles. Mei Xiang is a very good mother, teaching Bao Bao how to climb, eat bamboo, and dress to advantage. My mother probably started talking to me about clothes when I was 11 or 12. She’s very stylish and has an excellent sense of what looks good on herself and how to wear it. With me, she was maternal but firm. She never told me that I had to wear something or that I couldn’t wear something, but she told me what looked good and what didn’t — and why. And she didn’t tell me that I looked good when I didn’t – doing so would have been a disservice. A dereliction of her maternal responsibility! Notably, she stopped providing this guidance roughly around the time I started working — not because I haven’t put on a ridiculous or unflattering outfit since 1991 but because at that point she must have figured it was time for me to work through these things on my own. The point of this post isn’t that my mother is a wonderful mother, though she is. My point is: Early training is deeply ingrained. When I need an extra boost for a work meeting, I wear one of my mother’s Liberty scarves — which she lent to me in the mid 1990s so I would have some pretty accessories to wear to work. And because our tastes run along similar lines, I periodically find myself buying my mother something that I’ve bought for myself. We live 1,000 miles apart, but I like the idea of a 44 year-old woman and her 72 year-old mother wearing matching ensembles. In case you missed it, the New York Times ran two lovely pieces last year on mothers and their influence on their daughters’ style and clothes: Mom Genes by Leanne Shapton and Dressing Like My Mother by Anna Nordberg. Enjoy! This is fascinating! Those damn French women with their smoking and cheese eating and glamour spreading. I think many of us Americans believe that style is an inherent trait: you either have it or you don’t. Au contraire, mon frere! You CAN learn style, and it seems that the sooner you start paying attention, the better. I’m mother to 2 very different 10.5 year old girls. One sports a belt or a vest (or both) when the ensemble calls for it; the other is lucky if she can find clean pants. Clearly, I have some work to do. GREAT post! Thank you! I’m sorry to ask this, but how then do you/ your mother account for the pajama-pant wearing phase in college? I am so glad you asked. Context is everything. “Properly dressed” in Middletown, Connecticut in 1988 encompassed pajama pants as daywear. I would have looked far stranger at that time wearing a grey flannel sheath dress and wrap sweater.